The coastal surveillance market is projected to grow from USD 29.08 Billion in 2016 to USD 34.34 Billion by 2021, at a CAGR of 3.38% during the forecast period. The base year considered for the study is 2015 and the forecast period is from 2016 to 2021. The report analyzes the market on the basis of application (command & control, communication, computers, intelligence, surveillance and reconnaissance, electronic warfare), end-use (naval, coast guard, and others), structure (national, regional and port), scale (large-scale surveillance & moderate scale surveillance) and maps these segments and sub-segments across major regions worldwide, namely, North America, Europe, Asia-Pacific, the Middle East, and Rest of the World. The report provides in-depth market intelligence regarding coastal surveillance market dynamics and major factors that influence the growth of the coastal surveillance market (drivers, restraints, opportunities, and industry-specific challenges), along with an analysis of micromarkets with respect to individual growth trends, future prospects, and their contribution to the overall coastal surveillance market. The report also covers competitive developments such as long-term contracts, joint ventures, mergers, new product launches and developments, and research & development activities in the coastal surveillance market, in addition to business and corporate strategies adopted by key coastal surveillance market players. Market size estimations for various segments and sub-segments of this market were arrived at through extensive secondary research and government sources, such as the U.S. Department of Defense (DoD), the U.S. Air Force website, company website, corporate filings, such as annual reports, investor presentations, and financial statements, and trade, business, and professional associations, among others. Corroboration with primaries and further market triangulation with the help of statistical techniques using econometric tools were carried out. All percentage shares, splits, and breakdowns were determined using secondary sources and verified through primary sources. All possible parameters that affect the market covered in this research study have been accounted for, viewed in extensive detail, verified through primary research, and analyzed to get the final quantitative and qualitative data. This data is consolidated and added with detailed inputs and analysis from MarketsandMarkets, and presented in this report. The ecosystem of the coastal surveillance market comprises manufacturers, distributors, and end-users. The key end-user of the coastal surveillance market is the defense sector. The system providers for coastal surveillance are Northrop Grumman Corporation (U.S.), Thales Group (France), Terma A/S (Denmark), Kongsberg Gruppen (U.K.), SAAB AB (Sweden), Elbit Systems Ltd. (Israel), and Indra Sistemas S A,(Spain) offering advanced technology systems, products, and services. These players are adopting strategies such as agreements and partnerships, new product developments, contracts, and business expansion to strengthen their positions in the coastal surveillance market. The coastal surveillance market is projected to grow from USD 29.08 Billion in 2016 to USD 34.34 Billion by 2021, at a CAGR of 3.38% from 2016 to 2021. Factors such as increased demand for network centric warfare, situational awareness, survivability, and qualitative naval superiority will drive the demand for the coastal surveillance market. On the basis of application, the coastal surveillance market has been segmented into the command & control, communications, computers, intelligence, surveillance & reconnaissance and electronic warfare application. The intelligence segment is projected to grow at the fastest CAGR during the forecast period, 2016 to 2021, primarily because coastal surveillance systems utilize radio networks to transmit intelligence, surveillance & reconnaissance information from global positioning data to video and sensor data. The market for coastal surveillance has been segmented based on end-users into naval, coast guard, and others. The naval segment dominates the studied market, and is expected to continue its dominance over the next five years. The naval-based platform offers various advantages in surveillance such as the availability of wider tracking areas, less interruption, and easier coordination. On the basis of scale, the coastal surveillance market has been segmented into large scale surveillance and moderate scale surveillance. The increased number of illegal activities in coastal regions such as smuggling and illegal trade has been driving the need for moderate scale coastal surveillance systems. Large scale surveillance systems are used to monitor the wider areas, such as, ports, hazardous areas and for vessel traffic control. 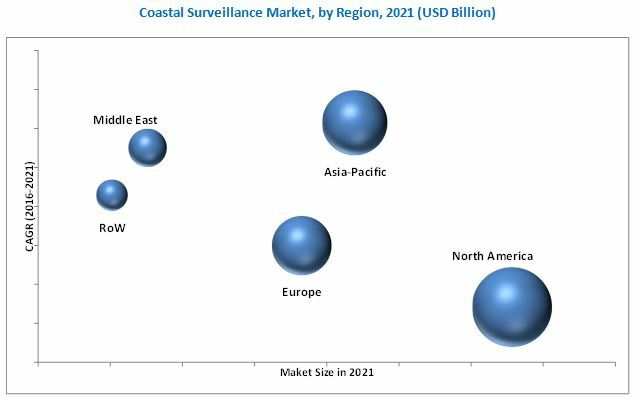 The APAC region is expected to exhibit the highest growth rate in the coastal surveillance market, during the forecast period from 2016 to 2021. The market growth in the Asia-Pacific region is attributed to the increased military spending in countries such as India and China. With geopolitical tensions in the South China Sea and border issues in several countries, procurement of coastal surveillance is estimated to increase across the region. China, South Korea, Japan, and Indonesia are the key growth countries in this region. Some factors such as defense budget cuts in developed economies and the scarcity of resources to manage the changing technological environment may inhibit the growth of the coastal surveillance market. 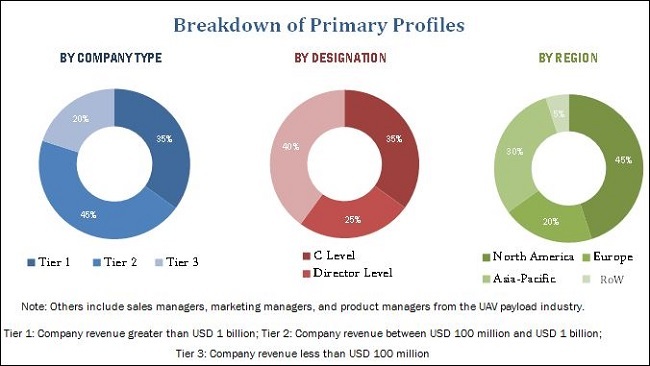 The key players in the coastal surveillance market are Northrop Grumman Corporation (U.S.), Thales Group (France), Terma A/S (Denmark), Kongsberg Gruppen (U.K.), SAAB AB (Sweden), Elbit Systems Ltd. (Israel), and Indra Sistemas S A,(Spain), among others. Contracts is the key strategy adopted by the industry players to achieve growth in the coastal surveillance market, which accounted for a major share of the total growth strategies adopted by the leading players. For instance, in April 2016, Thales Group received a contract from the Malaysian Maritime Enforcement Agency to supply Fulmar surveillance drones to enhance the agency's surveillance capabilities. Fulmar, a small fixed-wing UAS, will be installed on six new generation patrol craft being built by Destini Shipbuilding and Engineering, Malaysia. Fulmar features automatic detection and tracking systems with an automatic identification system. 13.12 Controp Precision Technologies Ltd.